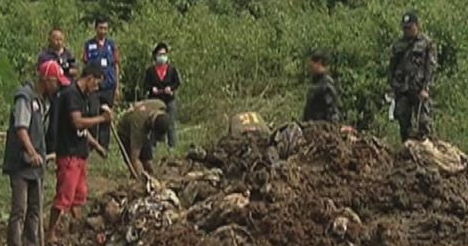 Authorities in Ozamiz City have uncovered what are believed to be mass graves of victims killed by the Parojinog family. Police may they way to barangay in Ozamiz City early Friday at the recieving report of suspected dumping grounds allegedly used by the Parojinog family. Ozamiz police chief Jovie Espinido personally led the excavation. According to Brgy. Captain Ludvina Macayran of Cogon, Ozamiz City, the purpose of the excavation is to end the hearsay among the populace in the area that there were victims of murder being thrown in the said mansion. The Brgy. Captain also received complaints from the residents in the area about a foul odor sometime in February that made the council filled the big holes with trucks of soil. The information received by the authorities said that the recent buried of alleged remains happened only last month. The bodies were said to mostly belonging to non-locals who went to Ozamiz, and suspected military and police assets. But, when the backhoe started to dig the holes, sacks of garbage were excavated and there were two sacks tied with rope only containing bones and feathers of animals. Espenido said he ordered the excavation to know how true the revelations about the so called secret mass grave in Ozamiz. The Chief further said he received reports that those being murdered were just thrown at the said place. The Ozamiz Chief of Police also planned to excavate the old mansion of the Parojinogs after he received an information that the demolished old residence of the former Mayor Aldong Parojinog became a mass grave and hideout of the alleged members of the Parojinog syndicate. A man claimed that he had work for the Parojinogs as hitman and drug courier for 20 years said that he chopped the bodies of the murdered foes of the former Ozamiz Mayor.